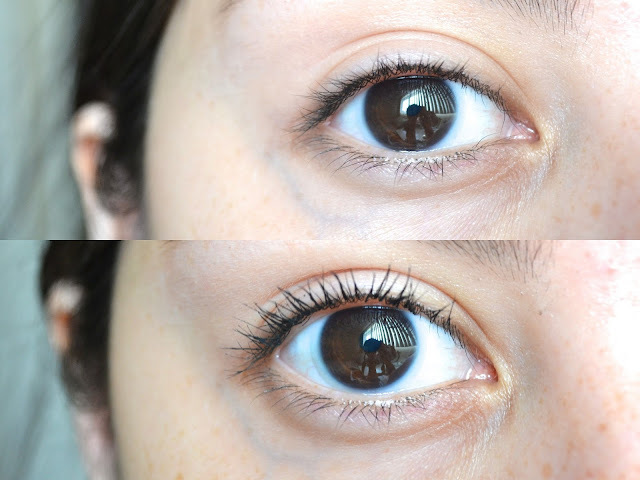 Today I have a review of the newest mascara from Maybelline called Spider Effect Mascara, which is in The Colossal line. This is supposed to give you bold, sculpted lashes with maximum length. I ended up buying the Waterproof formula which I had made a mistake and wanted the original formula. I decided to try it out anyway and see how it would work. Find out more about this mascara below! New Colossal Spider Effect mascara adds dramatic volume, groups and sculpts lashes to bold, pointed tips. The brush was interesting since it has these spiky bristles which made some of my lashes stick together when I was brushing through. I know that was the effect that it was suppose to make. The formula was a bit wet, but not bad to where it was hard to work with. I actually ended up liking this mascara and the results I got. The mascara helped to give my lashes length and it even held my curl all day with no problems. The only downside to this was that it was waterproof. I wish I would of picked up the regular one and I probably would of loved it way more. But for what it was, I would say that Maybelline Spider Effect Mascara was good. Maybelline The Colossal Spider Effect Mascara retails for $6.99 and can be found at Ulta, Walmart, Target , and other retail stores. I love waterproof mascaras! Maybelline the makes pretty good ones so I might give this a try.